We are housed in the beautiful new facility of the Orange County Church of Christ. We have new, up-to-date classrooms that are well-furnished and well-supplied. We have a large play area with a new playground that your child will love. We have a separate play area for toddlers. Our outdoor play environment has been specifically designed for the total development of the child. Your child will be able to spend delightful hours engaged in climbing, sliding, balancing, riding and playing with others. 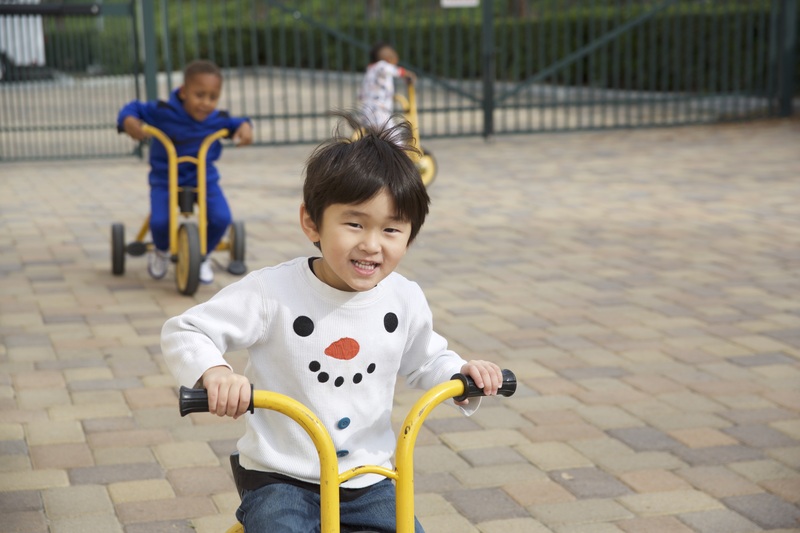 Safety surfaces that absorb falls cover the portion of the playground underneath equipment, while hard surfaced areas are provided for wheel toys, ball play, group games and art activities. We also offer a garden area where children may enjoy planting and scientific discovery. Under the watchful supervision of our skilled staff, your child will be safe, secure and happy with friends of the same age. Each classroom’s daily schedule includes at least two outdoor periods. It is our policy that children who are well enough to attend our center must be well enough to participate in all activities, including outdoor play. Please be sure your child has adequate outdoor clothing. Please notify the Director if there are any health conditions, such as asthma, that may restrict your child’s ability to play outdoors.